The USA is the third largest country in the world with an area of 9.83 million km2 and a population of 314 million people. Due to the immigration from a variety of countries, the USA is an ethnically and culturally diverse nation. It is an industrialised country and has the world´s largest economy determined by the wealth of important natural resources, a well-developed infrastructure and a high average productivity. The life science industry’s research activities in the United States continue to lead the world. Not only is life science - led by the biopharmaceutical sector - the leading U.S. industry in terms of volume of research, U.S. life science research & development (R&D) accounts for 46% of the global total - one of the highest shares in any industry. 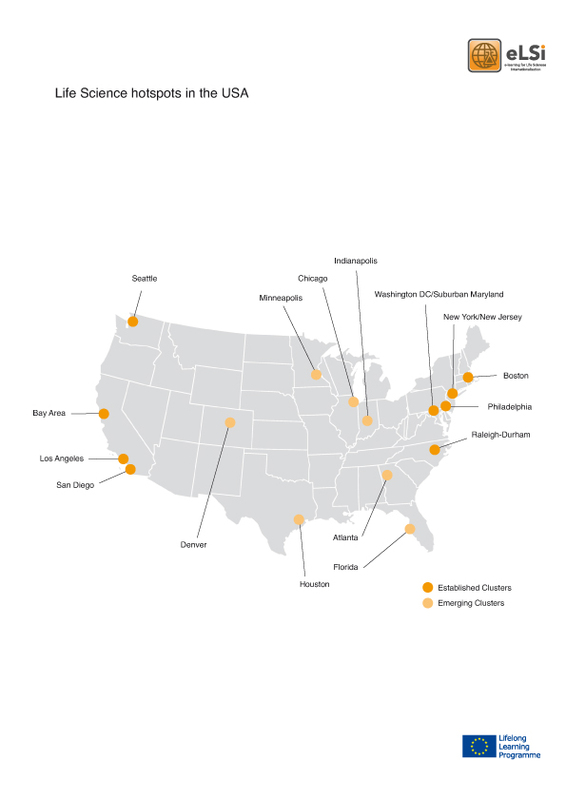 Overall, there are nine established life science clusters spread across the U.S.
America is the largest consumer of biotechnology products worldwide and provides the largest market with 1,300 companies and more than 5.5 million scientists, engineers and technicians. Of these, 1.3 million are working directly in the field of biosciences while another 5.8 million are active in related industry sectors. The U.S. biotechnology industry is strongly supported by the American government, which promotes the commercialisation of products for national and international trade. The medical biotechnology element is the largest sector and produces biological drugs, vaccines and in-vitro diagnostics. Major areas of research are diseases with no effective treatments as autoimmune and infectious diseases, cancer as well as HIV. In the agricultural sector, an annual gain of 10-15% is expected commercialising biotech crops. Other big research fields in the U.S. are nanotechnology, enzymes and biofuels, which belong to the industrial biotechnology. In particular, the development of renewable energy and biodiesel is important, due to the fact that conventional energy sources will be reduced by 15% in the beginning of 2015. The innovative biotechnology industry combined with scientific research form the basis for growth in the pharmaceutical sector. The U.S. owns the intellectual property rights to most new medicines. Besides generics, which are sold much cheaper than the original especially on the U.S. market, another important role in the American pharmacy play over-the-counter (OTC) drugs in light of an aging population and the aim of transforming prescription medicine into OTC ones. About 272,000 people work in the pharmaceutical industry and this sector spent $67.4 billion in R&D in 2010. The eLSi materials provide detailed information about the pharmaceutical and biotechnical industry, regulations and business culture in the United States.